There are movies you want to cheer for, but end up feeling lukewarm about. Roland Joffé’s (The Killing Fields, The Mission) laboured adaptation of Michael Ashton’s play, The Archbishop and the Antichrist, is one of them. With Archbishop Desmond Tutu having celebrated his 87th birthday on Sunday, it would be nice to celebrate a film that honours the great man’s role as chairman of the Truth and Reconciliation Commission in 1996. Sadly, the often-stilted script, the over-long running time (120 minutes) and Forest Whitaker’s awkward impersonation of the “Arch” make it difficult to comply. 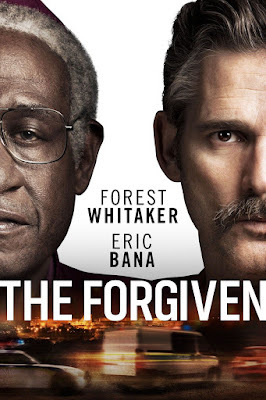 The core of this fictional tale (based on fact) is the confrontation between Tutu and a vicious, racist killer, Piet Blomfeld (Eric Bana), who is serving a long sentence in Cape Town’s Pollsmoor Prison. Blomfeld, a former security cop who operated with bloody impunity during the apartheid era, has written a letter to Tutu asking for amnesty. The letter appears to be a cynical ploy, because their first meeting in the prison shows that the abusive Blomfeld is rabidly unapologetic. Tutu seems partly interested in the challenge to his Christian ideals posed by Blomfeld, but also in the details of a bloody police action, Operation Hacksaw, which may reveal the fate of a young woman whose traumatised mother (superbly played by Thandi Makhubele) has asked him for assistance. Blomfeld’s letter includes a quotation from John Milton’s epic poem, Paradise Lost, and one of that poem’s unfortunate characteristics radiates out into the movie. Try as he might, Milton’s God is a bland, colourless creation compared to his bad guy, Lucifer, who is given all the best lines. Similarly in the film, the physically commanding Bana has much the showier role as the racist cop, and the American actor exploits his dramatic opportunity with relish. The result is that Blomfeld’s impact – despite or perhaps because of his evil profile – is that much greater than Tutu’s, who is given a series of stilted religious speeches about good triumphing over evil. It doesn’t help, either, that Whitaker has been given a rather distracting prosthetic nose to lead with. The story has been padded out with a number of extended jail scenes involving the “28” gang, a particularly nasty bunch of criminals who rub up against Blomfeld. One of their new members, Benjamin (Nandiphile Mbushu), is given instructions to murder Blomfeld, which in turns leads to a “reveal” about the former security policeman’s character and past history. If much of the film feels tiresomely wordy, there are some powerful moments, none more so than a sequence between a security policeman and a bereaved mother (Makhubele) that really punches its emotional weight. Films like this one are often derided by South African critics for being made for foreign audiences and having foreigners as stars. Yes, but ... ultimately it’s a futile reaction because this particular status quo will obviously remain for as long as our own film industry doesn’t step in and make movies like these themselves. The South African connection is not, however, completely invisible. In addition to Makhubele, a number of South African actors have been given cameo roles, among them Terry Norton, David Butler, Morné Visser and Ian Roberts.